Inseam ease ~ front or back? My background... I am in the tailoring/sewing profession and did a three-year apprentice with a master tailor back in the 70's along with multitude of other training both before and after. I work for a major apparel/sportswear company along with having my own home studio... the focus of my work is custom (bespoke) tailoring, the emphasis (demand) for the past few years being on slacks/trousers. I'm here on the forum almost daily but finding the time to post is the challenge! The situation: my training has always been to add ease to the back leg of the inseam through the thigh area. I have recently been given a first-draft pattern where the ease has been placed on the front leg. 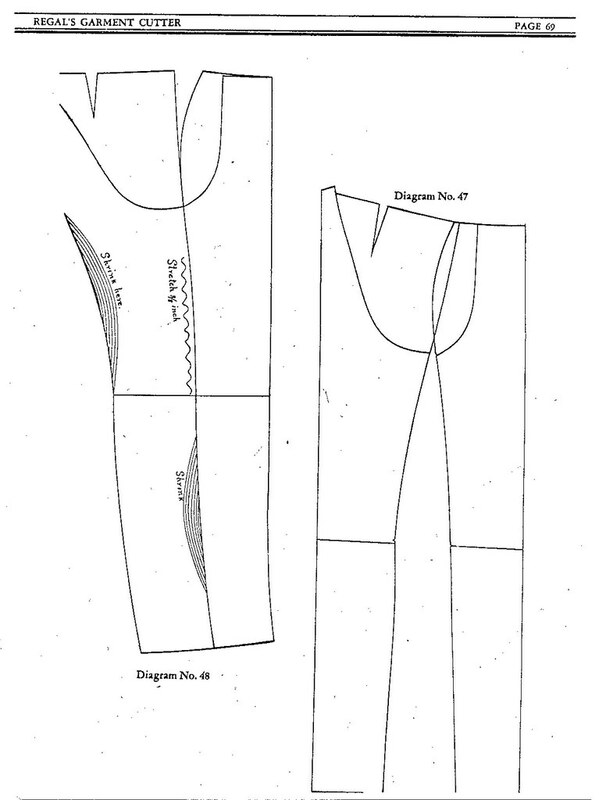 The top 12" of the back leg inseam is stretched to fit the front leg inseam. This raises lots of red flags to me ~ but in doing some research of commercial patterns I've found the same thing a couple of times. The question: Can anyone tell me what their own experience has been with this area? What kinds of issues would this raise having the back leg/thigh stretched to the front? Or is this now the accepted practice and I've been stuck behind the times? Edited by NW Tailor, 16 December 2009 - 03:54 AM. Are you walking the sewing line from the cuff to the crutch? If so, the back seam length should be about 5/8" longer than the front seam length. One possibility for the discrepancy is a jump seam. The back may have a 3/4" seam allowance; and, the front a 3/8" seam allowance. I'd rule that out before having a conversation with the patternmaker. Also: is this pattern for a plaid? If so, the ease will need to be placed a little more vigorously toward the fork - within 8" - so the plaid matches around the leg in the visible areas. My opinion, though, is this: if the pattern is wrong, reject the work. It's an indicator of systemic problems yet to come. I used to do overflow sewing for several factories. And, I've had such aggita and drama over bad patterns, poor information and horrific cutting/bundling that I am highly disinterested by the prospect. RE: the draft. I understand how a seam length error occurs in that specific area. But... a draft needs to be audited, checked, adjusted and trued before it's ready for the sample stitcher. If they haven't done that - or, haven't done it properly - that infers some serious process problems. I'm all for helping the next person to improve if they genuinely want to. But, I'm not going to force it down their throat or waste time on non-paying jobs. If you have a proven pattern for reference, use that to demonstrate how seams are walked and where ease is placed. It should never take more than 15 minutes to help someone to improve themself. Longer than 15 minutes is a training session, which should be billed for (IMO). FWIW: I do not accept any outside work (e.g. cut bundles, patterns, etc.) until I have audited the pattern, the sketch, the fabric and some sort of technical documentation. Anyone who poo-poos those requirements was never meant to be my customer. Edited by jcsprowls, 16 December 2009 - 04:58 AM. I stretch the inseam of the back panel above the knee so that the back will curve neatly beneath the seat, and stretch the inseam of the front panel beneath the knee so the leg will curve over the calf. Scroll down for photos. Yes, I walk the sew line from hem to crutch... and the amount of ease you've mentioned is generally what I've incorporated into the process. I've already taken into account the jump seams and they don't play into what I'm seeing happen with the longer length of the front leg inseam. My original question was based on seeing this odd (in my opinion) practice and wondering what would be the merit of removing the ease of the back thigh. I've got to read up on the link from Jeffery as at first glance he's removing the back ease completely. There was a thread on ironwork with some german plates but I've managed to find one in English from Regal's which shows the same. Regal's would have you stretch the back of the thigh 3/8"- in my experience Regal's is fairly conservative so for closer-fitting styles you would need to stretch more. Straighter legs will require less stretching. There is another way, and that is to shrink the front top 12-14 inches lenght area to match the back. Baste the two, front and back together and then put a damp cloth on top and set the iron on top. Only shrink the seam to about 1 to 1 1/2 inches from the seam, further away is not to be shrunk, if I remember correctly. I draft trousers (slim fit) with the back inseam as long as the front inseam or if the customer wants a fine look from behind back inseam about 0.5-1 cm shorter. Then with ironwork this will be stretched. The left part of the front seam is a bit longer as the right - depends! Edited by posaune, 16 December 2009 - 09:15 PM. I also draft trousers with a shorter length on the back inseam from knee to crutch. The amount depends on the style of trouser- closer fitting through the thigh means that the back inseam is less on the bias, and in full legged trousers the back inseam is more on the bias. If the back inseam is not shorter, the bias stretches out from knee to crutch and you won't get a clean fit on the inseam. If the fabric is loosely woven or drapey and the pattern is for a larger person, the effect can be draggy lines in the back of the thigh emanating from the inseam. As Terri says, it does depend on the style. If a slim cut, the stress and range of motion needs to be thrown to the front side, so the ease shifts to the front inseam. Since this is for your dayjob, we probably can't see the sketch or the pattern pieces to assess. My apologies for assuming it was a contemporary tailored trouser. A jeans inseam or a cotton pant inseam would be handled differently. Because of the sharp angle of the back upper inseam, I've always eased it into the front leg inseam from above the knee to the rise. Can anyone predict what will happen to this area should it be cut shorter and stretched instead? Keep in mind this is being worn for golf, meaning squatting, bending, and twisting much more than one would usually do... and the last thing I want to have happen is the inseam ending up too tight and pulling the rise or causing excess tension, and thread breakage, on the rise seam. I'm trying to get a mini of the pattern to post so you can see the contrast between the front and back inseam angles. Admittedly, cutting the back inseam equal to or shorter than the front is a brand new method to me ~ I may have to make a full proto that way and send someone out to try it and see what happens! You are mentioning problems that are also related to what I call the "ball of the seat". If the angle is not correct and the dart widths not correct (or darts) there is pressure in the seat. If the person sits down and the hem comes away from the shoe these two reason could be why. One time I was trying a new system and wasn't feeling well and cut the darts half width, every time I bent over to pick something up off the floor there was pressure in the seat area. I had made a previous pair before and this system has a really short front fork and the back fork is much longer, so more on the bias; and, it was on this system where the directions are to shrink the top front inseam, the extra 3/8 inch. With a new pattern system and expensive cloth I would have a basted fitting with inlays and no darts cut or pocket put in. Another directions I saw was something like this; for a stooped person that looks like they have a flat seat, but doesn't- to pinch out the excess of back rise but also stretch that side seam up to 3/4 inches, cut off the excess at the top and sew it up. The stretching is a little above the knee to about the bottom of the pocket entrance. The directions for corrections is without end. Jeffery, I wish my English would be better to explain, there is so much writing for nothing. It’s not the stretching of straight seams who cannot be stretched, it is the shrinking what stretches the opposite of the pattern part. The pictures says it right. Front leg and back leg has to be ironed in Bruch first, then you saw back leg and front leg together and when the trouser half lays in front of you, you see where exactly the shrinking is necessary, like in your picture. But I think you did it right. I don't mind people posting technical things in French or Italian as long as there is someone to translate. I understand how difficult it is to write technical prose in another language.